Many people yearn for lush, green grass in their yards, but can never seem to achieve the exact desired results they are looking for. This is because they are using too much or too little water for the grass to grow correctly. Do you know about watering your lawn in North Texas? Many people take the time to learn about fertilizing their lawns, but not about watering it. The amount you water your lawn will also tremendously impact its appearance. If you are unclear about how often to water your lawn, please read and follow our Lawn Watering Guide for some great lawn watering tips. Because you live in the northern region of Texas, you are no stranger to droughts and water shortages. When you are trying to keep your lawn looking beautiful, this can be a tricky obstacle to overcome. Luckily, there are ways that you can work with the water bans, conserve water, and still manage to keep your lawn looking good. In fact, if you are in a quandary about watering your lawn in North Texas, you may be surprised to know that deep, infrequent watering is far better for your lawn than shallow, frequent watering, so drought and watering bans needn’t have a negative impact on your lawn at all, if you know what you’re doing. Establish some smart practices to make the most of freely available water. Just as there are droughts, there are also spells of rain. Setting out large barrels to collect the rainwater. – Collecting during the rainy season can prove helpful during the dry season. Collecting rainwater will allow you to give your grass an occasional deep drink, even when watering your lawn with traditional irrigation is prohibited due to a water shortage. Be sure to put a mosquito dunk in each barrel to prevent breeding mosquitoes. Making good use of water at the right time of day. – The very best time to water your lawn is early in the morning, while the blades of grass are still covered with dew. The sunlight evaporates the water. So watering them early, when they are already a little damp, will really help them absorb and retain the water. Watering at night if the weather is extremely hot. – Watering at night is not usually recommended, but there is an exception to that rule when the weather is extremely hot. During the summer months in North Texas, watering your lawn at night is sometimes a good idea. It allows the grass to soak up more water. You don’t have to worry that the water will sit on the grass and cause mold or mildew, because the heat will evaporate the water quickly, even at night. Does My Grass Have Enough Water? As we said, if you are anxious about watering your lawn in North Texas, you can calm your fears. You are really better off not watering daily. Realistically, you only need to water your lawn once or twice a week, or even less. It takes only an inch of water to make your grass happy, and watering seldom but deeply. This will result in a greener and stronger grass and grass roots. You can determine whether or not your grass needs water by pressing a thin shovel or knife blade into the soil. If the blade slides in easily, and you see that the soil is slightly moist six or eight inches down, you don’t need to water quite yet. Give it another day or two, and when your grass begins to look a bit droopy, give it a slow, deep watering of about an inch of water. Using soaker hoses provides nice, even, deep watering. If you have more questions about watering your lawn in North Texas, or you need any other assistance with lawn, yard, and garden care, you can get some great advice and service from our Ryno Lawn Care, LLC lawn experts by calling 214-728-8894. We are so sure that you will like our services and prices, that we will offer you a free consultation and estimate. 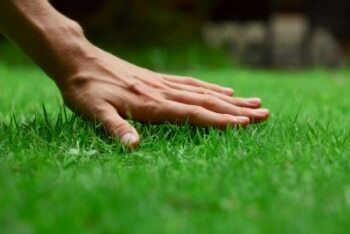 There is no pressure to make a commitment, but if you are looking for the best lawn care service in the DFW area. Ryno Lawn Care, LLC is definitely the lawn care service for you. I didn’t know that too much water could be harmful but now I do! I guess it makes sense that it could cause a lot of mold growth or even rot the grass at its roots well below the surface. It’s hard to know just how much to water and when you have just the right amount.